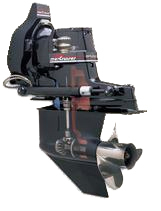 Many people with Inboard/Outboards, and outboards, have the common misconception that you should put your stern drive or outboard in the "up" position when the boat is at the dock and not in use, or when it's in storage. This may alleviate growth on the lower unit when your boat is in the water, but it causes other problems. Leaving your drive in the "down" position takes stress and strain off of the bellows covering the U-joints. The bellows are stretched when the drive is in the raised position. This eventually can lead to cracking and leaking. Water can get past the gimbal bearing and your boat could sink. Leaving the stern drive or outboard in the "down" position, whether your boat is in or out of the water, also means less pressure on the hydraulic system. And if you trailer your boat any distance, consider using trailering supports to protect your tilt & trim system. If you're concerned about growth on the lower unit, use an antifouling paint instead of just regular high temp motor & drive paint on your lower unit. For those of you who store your boat outside in the winter, if the drive or outboard is left up, rain water, melted snow, and condensation can collect in the exhaust cavity of the lower unit, which can freeze and crack the housing. To prevent theft, consider removing your outdrive and replacing it with a stern-drive storage cover after winterizing. Or you can use a stern drive lock, which replaces one of the mounting bolts. For more information, see our Spring Maintenance and Winterizing helpful hints.